By Gregory Sanders: This article has been updated to reflect the most accurate information regarding plasma cutters available for those who are interested in steel cutting. The best 5 available have changed, and information has been added to assist individuals in finding the plasma cutters currently available on the market. The FAQ has also been updated. Plasma is a form of matter that can be created by applying electricity to a gas. This is precisely what happens in a plasma cutter where an electric arc is applied to the gas in order to excite the gas particles and make them electrically conductive. Depending on the unit you use, your plasma cutter will use oxygen, nitrogen or even environmental air as the gas and force this inside the torch. Meanwhile, electricity is generated from an external power supply and applied to the high-pressure flow of gas. This creates a ‘plasma jet’, which has an incredibly high temperature up to 40,000 degrees F. This simple technology uses an electrical arc and compressed air to cut steel, aluminum and other conductive metals. The Lotos LTP5000D is a 50Amp Non-Touch Digital Inverter Air Pilot Arc Plasma Cutter delivers strong cutting performance in a compact package. The pilot arc feature is especially useful for continuous cutting on rough surfaces. MOSFET transistors optimized design provides high power, steady output and can cut through tick and thin metals. The Lotus LTP5000D is an excellent choice for home and light duty small projects. The PowerMax 45 has simple controls; a stable plasma arc and a patented drag technology that make it easy to operate. A versatile and portable 12mm machine that can cut metal quickly, cleanly-even electrically conductive metal. With 45 amps of cutting power and Hypertherm torch technology it enables easy cutting of 1/2" (12mm) thick metal and has a severance capacity of 1" (25mm). Although pricey, with a broad set of application capabilities, the PowerMx45 is a great multi-purpose tool. The Hobart Airforce 12iPlasma Cutter is a plasma cutter with a built in compressor powered by standard household voltage (120 VAC). It excels at cutting sheet metal and 1/8-inch mild steel, and can even sever 1/4-inch mild steel. This unit has some smart design features such as a smaller heat-affected zone to prevent warping and no slip grip and finger contours. It also lets you use a no gas pressure mode for tuning the flame and ultimately allows you to achieve a more exact cut with a thinner kerf and less slag and mess to clean up after. 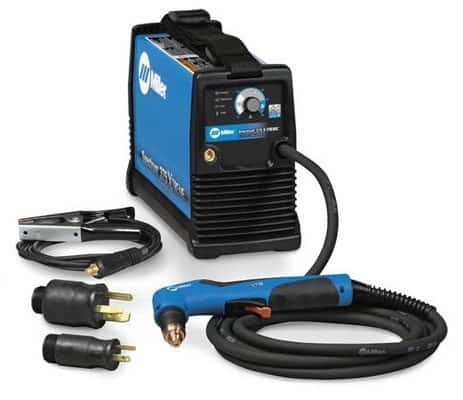 The built-in air compressor and lightweight inverter power supply make this plasma cutter a convenient, totally portable, efficient cutting system. The Spectrum 375 is small, lightweight and very portable. For it’s size, this plasma cutter packs a lot of power. The cutter uses state-of-the art MVP for plugging into selected power sources. The Spectrum 375 is one of the most professional units designed for garage, farm, ranch or small business purposes. 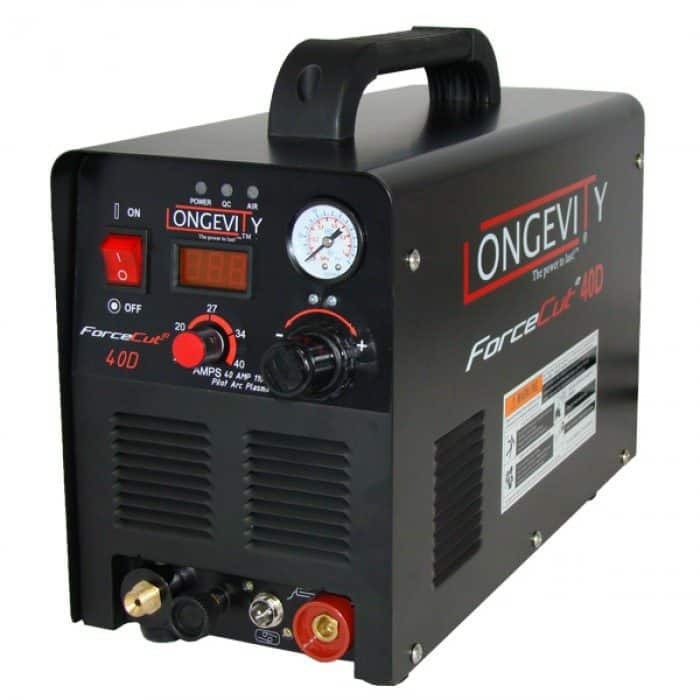 The Forcecut 40D is a pilot arc plasma cutter powerful enough to cut through ½” of steel. This is a hardworking little cutter that cuts clean and straight. It has a built in air-separator and can run off of 110V or 220V. Features Thermal Overload Protection and Low Air Pressure Warning. This is an inexpensive, efficient little cutter for residential and hobby use. Plasma Cutting technology is a rapidly growing alternative to oxy-fueled. Laser and water-jet cutting technology for many reasons. Anyone can easily use this equipment with minimal training. Plasma Cutters generally don’t require complicated adjustments to achieve and excellent cut quality. Plasma Cutters can cut or pierce thick metals in seconds compared to oxy-fueled cutters. The speed increases as the metal thickness decreases, so you can achieve greater productivity with a Plasma Cutter. You can achieve a quality cut on a wide range of materials including painted, rusty or dirty metal. Since Plasma cutters use nitrogen, they can cut through steel, aluminum and other metals up to an 80 mm thickness and give an efficient and precise cut. The ability to cut several types of metal is essential in many operations. Because plasma is an electric arc process, cutting any material that is electrically conductive including aluminum, copper, mild steel, stainless steel, and more is made easier. At the same time, plasma cutting is able to cut several plates stacked atop one another. All of these are impossible to cut with an oxy-fueled cutter. Plasma Cutters operate on electricity or compressed air; they do not use highly flammable gases. Plasma Cutters are lower in cost than oxy-fueled, laser and water-jet cutters. You need to consider a few things to choose the best plasma cutter for your garage, farm, ranch or small business use. The first things you need to look for are the best plasma cutters with a built in compressor. You want the air/gas compressor to be built into the unit itself, making it a self-contained and fully functional tool rather than something that requires an additional, external gas supply. The next thing you need to determine is the thickness of metal most frequently cut. Most plasma cutting power sources are rated on their cutting ability and amperage. Therefore, if you most often cut ¼" thick material, you should consider a lower amperage plasma cutter. If you most frequently cut metal that is ½" in thickness look for a higher amperage machine. Even though a smaller machine may be able to cut through a given thickness of metal, it may not produce a quality cut. Instead, you may get a sever cut which barely makes it through the plate and leaves behind dross or slag. Plasma cutters create temperatures that are extremely high, which requires a fair amount of power to operate well. Plasma cutters with built in compressors can be designed for 110-volt outlets or 220-volt outlets and will come with their own amperage rating. Many consumers use their plasma cutter for a variety of cutting applications and need to move the machine around a plant, job site or even from site to site. Having a lightweight, portable unit and a means of transportation for that unit - such as a valet style undercarriage or shoulder strap - make all the difference. The most portable plasma cutters will have built-in inverters, which allows for a smaller housing for the plasma cutter which is ideal if you intend on taking your device on the road with you. Make sure to look into the ‘duty cycle’ and average thickness. This tells you how long the plasma cutter can be used and its maximum cutting ability and what thickness of material its capable of cutting through. As a general rule, cutters with high amperages will be able to cut through thicker materials and will also have greater duty cycles when at lower amperages. Here you need to make the choice between a device that does only what you need it to as cheaply as possible, versus a device that will last a long time and offer the best performance – possibly being the better investment if you do a lot of cutting. Each of these Plasma Cutters is a top tier machine that will deliver outstanding results. Your choice will be determined by the type of application or job you want to perform, the types of metals you will be working with, the features you hold dear and your price threshold.